I’ve heard there was an old school just south of Alberta Street at 22nd Avenue. What’s the story? Yes indeed. You probably k now the vicinity of the old Vernon school south of Alberta Street. But you pr obably ne ver knew it was there, occupying all of the block bounded by 22nd and 23rd avenues between Going and Wygant streets. Old Vernon was a giant, imposing four-story wood frame building that commanded the center of the block with its main doors facing north. Periodic construction added space over the years, eventually filled out at 17 classrooms in the main building, and several outbuildings for shop, cooking and a play shed. It was a big place. 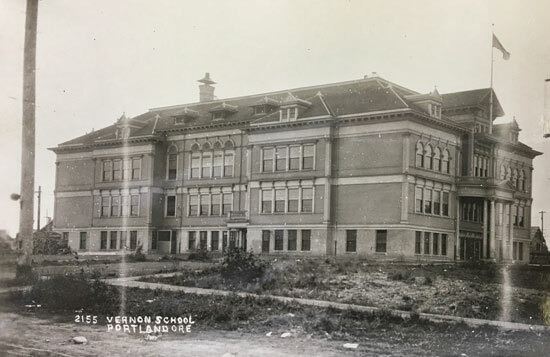 Old Vernon opened Sept. 15, 1908, with 324 students, many of whom were exports from Highland School (today’s Martin Luther King Jr. School at 6th Avenue and Wygant Street), which had overflowed with more than 700 students. By 1909, The Oregonian reported Vernon itself was already crowded and plans were being made to add a covered play shed, three portables and a manual training (shop) building. By 1914 the block was a small campus of four buildings, bulging at the seams with new students. Enrollment ballooned to more than 800 students by the late teens. Meanwhile, plans were being made to build other nearby schools to take the pressure off and create closer-to-home options for local youngsters. Kennedy School on 33rd Avenue was opened in 1915 as part of this push. By the mid 1920s, trends in school construction, safety and changing demographics were shaping the next generation of area schools. Disastrous school fires in other cities had galvanized the national building codes community – and Portland mayor Harry Lane – into calling for “fireproof” buildings. In 1926, the Portland School Board voted to close Old Vernon and build a new school on the site we know today at 20th Avenue and Killingsworth Street. This was not a popular move in the community, and required the school board to acquire and raze more than two dozen houses at the new site. The cornerstone on the new building was set June 6, 1932. A week later, when school ended for the year, Old Vernon closed for the last time. A few weeks later, Aug. 14, an arsonist set fire to the old school building, lighting up the sky for miles around and bringing the building’s life to an end. The site was cleared and sold to developers who began building houses on the block in the early 1940s. You’ll notice how house styles on that block are all later than those across the street. Now you know why. Do you have a question for the neighborhood historian? We love solving mysteries. Contact CNewsEditor@ConcordiaPDX.org with your question, and we’ll ask Doug Decker to do some sleuthing.